Yoga has grown up and shed its rustic ways. Yoga has grown up and shed its rustic ways. No longer a favorite of only the flower children, today’s yoga is as mainstream as a spinning or Zumba class. And the current high profile practitioners share very little with yoga’s hippie past. 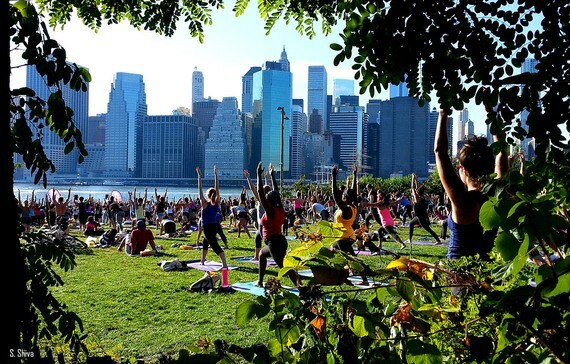 In the U.S., 15 million people practice yoga on regular basis. Nearly 45 percent of them earn over $75,000 annually. Women comprise a massive 72 percent majority who help sustain a $27 billion industry. They are younger too: 40 percent are under the age of 34 and the practitioner growth rate is holding steady at 20 percent. * I’ve named this cultural phenomenon the Yoga Generation. Moderate yoga is actually a great exercise and lifestyle. The combination of breathing techniques, focused stretching mixed with healthy diet, relaxation and meditation is truly a foolproof mind and body discipline. As a long time Rumi lover and teacher of advanced spirituality, I have been practicing various aspects of yoga since childhood and it’s heartwarming to see large groups of people embracing this ancient mind and body toning in droves especially in our high stress urban areas. Ally, one of my students, is a 22-year-old model and actress living in Los Angeles. She told me that in her yoga class the instructor said, “ego is not your amigo.” Ally started laughing out loud when she heard it because she thought it was a ridiculous statement. When she confronted the instructor after the class, he replied he was just repeating what he had been told without thinking. There lies the real danger when a popular trend gets infused with dogmatic mumbo-jumbo. Ally is smart to immediately detect a control mechanism. The other control phrase that is being used in yoga classes is bad karma. And in some yoga centers students are coerced into worshiping statues of Indian deities and to chant their names ad nauseam. The iconic comedian and master social observer George Carlin called this type of religious phraseology “spooky language” meant to scare the unsuspecting followers into submission. These control phrases such as ego is evil, be scared of bad karma and surrender to the teacher entered into U.S. yoga jargon by the shady Indian gurus in the ’60s and ’70s. Although these gurus, many of whom formed popular ashrams or compounds, have almost all fallen from grace and disappeared, their control tactics are enduring. Self-discovery, heightened levels of self-awareness and ultimately self-realization have been the goals of progressive, mindful individuals for eons. And the ego, which represents our individuality, fuels our passions and drives our creativity is in fact a very crucial element in one’s growth, therefore threatening to the controlling party. The reason the ego control phrase has survived for so long and keeps popping up in spiritual centers all over the world is because it has been cunningly used to keep the followers down and prevent them from questioning the system and that particular authority. We are in fact limitless beings living in an infinitely vast universe. Our known universe containing over 200 billion galaxies, each on average holding 100 billion stars and planets is obviously not maintained by an old guy with beard pointing a finger. As our societies continue to evolve we will drop such superstitions completely and learn to ignore spooky language all together. I call this process evolving from that of a slaved mind to an empowered mind. The positive side of the wild popularity of yoga is that many classes are secular and most practitioners are simply too savvy to allow religion and dogma ruin their great yoga buzz. They demand yoga without dogma. After all what does worshipping a statue and losing your individuality and drive have anything to do with a nice stretch, a warm feeling of connectedness and a few minutes of relaxation and meditation?